If you didn’t include a YouTube strategy as part of your broader marketing plan, you are missing out. YouTube has over 1 billion users and over 4 billion video views a day. Yet, the huge volume of content means succeeding on the channel is a fierce game. In this article, you’ll learn how to build a YouTube audience for your video content that will enable you succeed on this competitive channel. 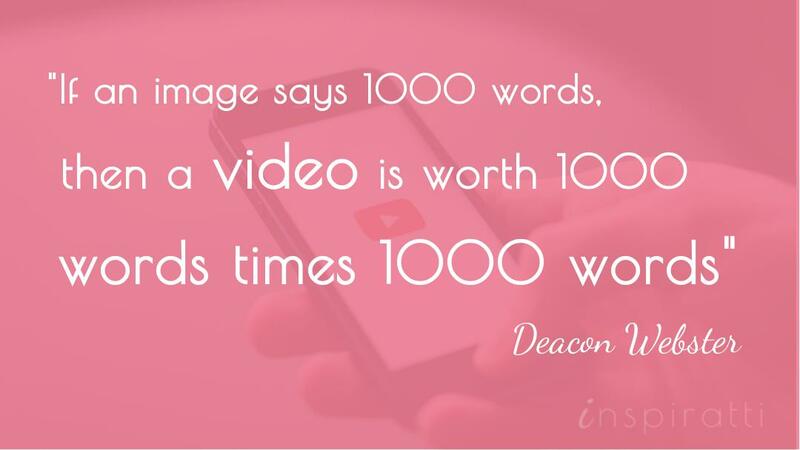 Let’s start by considering why video marketing is so important. Whilst traditional advertising is failing to captivate the 21st-century consumer, the popularity of video is booming. Research even indicates that video is the future of content marketing (MarketingThink). Video content is shared nearly four times more than other types of content, even images (Contently). Video is also highly persuasive and drives conversions: 77% of consumers say they’ve been convinced to buy a product or service by watching a video. This helps explain why businesses are dedicating even greater portions of their budgets to video (Wyzowl). Creating high quality, engaging YouTube videos will cement your credibility, increase your search engine rankings, and build trust with your audience. But to succeed, you need to build a loyal following on the channel. The first step to building a YouTube audience is creating video content, so let’s start there. Getting this first step right is crucial to your success on YouTube, so be sure to take the following points into account. Produce compelling, valuable, and engaging videos that precisely address your target audience’s needs. Ultimately, your videos need to have that “sticky” effect that compels people to pass it on. How? BuzzSumo found stories invoking emotions of awe, laughter, and amusement received the most shares. Still, there are other ways to capture attention. Shareablee notes that shareable content needs to help the audience to: gain knowledge, relive experiences, or provide valuable utility. Your video should, therefore, have a clear purpose, whether it be answering a question, solving a problem, or simply making people laugh. The following formats tend to work well: how-to’s, answers to frequently asked questions, expert interviews, screen video captures, and slide shows. Do your videos impart knowledge, share experiences, or provide utility? External inspiration tailored to YouTube. Published a blog post that gained huge traction? Consider how it could be repurposed as video content. But don’t simply replicate your blog content in video format; rather turn the content on its head: think of creative ways to tailor the content that exploit the unique capabilities of video. The combination of moving imagery and captivating sound means videos are especially powerful at telling a story and invoking an emotion. If they feature real people, videos also have the potential to build a more personal connection. You might also find inspiration for topics by searching for popular videos in your niche and consider how you can add a new angle on the topic. Ensure your brand voice is consistent across all video content. Start by considering the essence of your brand. What kind of words do you want people to associate with your brand? How can your videos convey these brand values? For example, an “intelligent” brand might convey this through the in-depth knowledge provided in their videos. Ensure your brand voice on video aligns with your brand voice on other marketing channels. This is particularly important if you already have a strong presence on other channels (e.g. website, email, Twitter). Start by assessing how you are conveying your brand values on your other channels, then adopt an aligned style for presentation of your video content. Choose the words, imagery, colors and sounds that complement your representation on other channels. Create a collection of video content precisely targeted to the needs of your target audience. Building a collection of related videos will help you to build a community of followers committed to your cause and establish credibility in that niche. 1. Create playlists that group together video content on similar topics. This improves navigability by helping users find the content they will enjoy the most. 2. Use player view to highlight new or popular video content, and set the video to autoplay. Don’t let your video get lost on YouTube. Create a strong promotional strategy so that your video gets found, viewed and shared. Ensure that your videos are easily findable, both within and outside YouTube (i.e. at the top of search engine rankings). How can you improve chances of your videos being found by your target audience? Whilst it is essential to include keywords in your title and the description, the most important thing is for the text to sound natural and authentic. Take time to craft a compelling video title and detailed description outlining what viewers can expect to gain from the video content. Ensure all titles, descriptions and tags used in your videos are accurate. Cross-promote related video content to your YouTube audience. Be sure to include calls to action, such as links to your other videos, playlists or channels, or a subscribe option. For example, you could have an annotation that directs users to a playlist of related content. Annotations can also be used to add interactivity and entertainment to your videos (Mashable). Update (2017): YouTube has discontinued the Annotations feature. Use the new mobile-friendly cards and end screens to deliver a strong call to action in your videos (Social Media Examiner). Cross promote your videos across your other marketing channels. Raise awareness of your videos by featuring your latest video content in your email newsletter and social media channels. You can also create a blog post on your video and use guest-blogging to increase exposure of your videos. Ensure the video experience is optimized for mobile (Social Fresh). Remember, more than half of YouTube views come from mobile devices (YouTube). But video content often displays differently across different devices. For example, as annotations don’t work on mobile devices, you should check all annotations are included in the description. To overcome the annotations issue, you might consider using featured content to promote a new video. Update (2017): Fortunately, the new mobile-friendly cards and end screens solve the annotations issue. “Audiences around the world are overwhelmingly open to mobile video advertisements that relate to their context and viewing patterns. Clearly, this is a real boon to global marketers that want to ensure they reach the audience segments most likely to be interested in their products or services”. Assessing performance of your video content provides important guidance for the next stage of your YouTube strategy. It enables you to create more content geared to the needs and wants of your target audience. Utilize YouTube’s analytic tools to better understand your YouTube audience, find out who is watching your videos and how they discovered them. You can collect information on an individual video and on all the videos you have uploaded. Careful analysis will provide you with a strong foundation to create more content that converts. Listen and react to feedback. Respond personally to all comments on your YouTube videos. But you also need to listen attentively to feedback and react accordingly. For example, if viewers ask for a follow-up video, ensure you provide one. Satisfying viewer demands will enable you to retain subscribers and attract new subscribers through positive word-of-mouth. Build an online social community by encouraging YouTube audience participation. By reaching out to their audience for suggestions of what to blend in their videos, Blendtec gained over 11 million views and over 7,000 comments for its “Will It Blend? — Glow Sticks” video. With video usage accelerating at a phenomenal rate, it is shocking that only 24% of brands are using online video to market to consumers. There is a window of opportunity to use video marketing to set yourself apart in the cut-throat social media landscape; but you can’t wait till tomorrow. Now is the time to leverage the power of video. So, sit down and work out how to incorporate video as a key part of your marketing strategy. Equipped with the techniques outlined in this article, you are set with the video marketing knowledge to get ahead on YouTube. All that remains is the implementation. So, get ready to press the record button. How do you use video content in your marketing? What strategies are you using to build a YouTube audience? What other channels do you use to produce and distribute your video content? Share your experiences in the comments. Enjoyed this post? Follow me on Twitter @laucocos for latest updates.